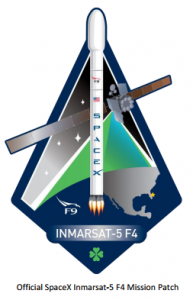 SpaceX continued its busy launch campaign today with the successful delivery to orbit of the Inmarsat-5 F4 communications satellite. The payload was originally planned to be launched using the companies Falcon Heavy Rocket due to the weight of the satellite. However, with the upgrades to the Falcon 9 over the years it is was powerful enough to perform the launch in expendable mode. To date this is the heaviest payload SpaceX has ever launched, this meant that SpaceX didn’t attempt a landing instead letting the first stage splash down in the Atlantic Ocean after separation. SpaceX has another launch planned for June 1st to deliver another Dragon vehicle to the International Space Station.